I substantially revised this post on April 18, 2014. 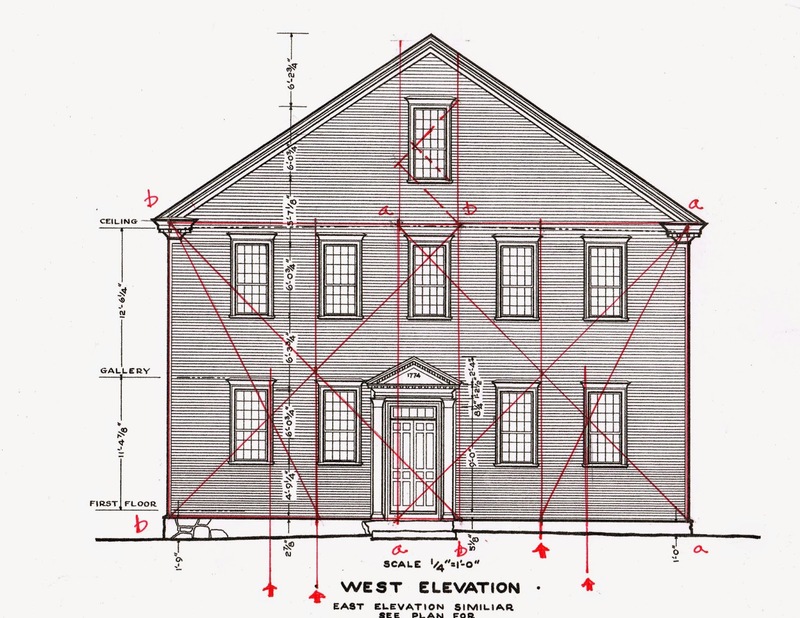 I was curious to find out if the geometric language used to design the Rocky Hill Meeting House could be seen here as well. I knew of the Sandown Meeting House but had never seen it. 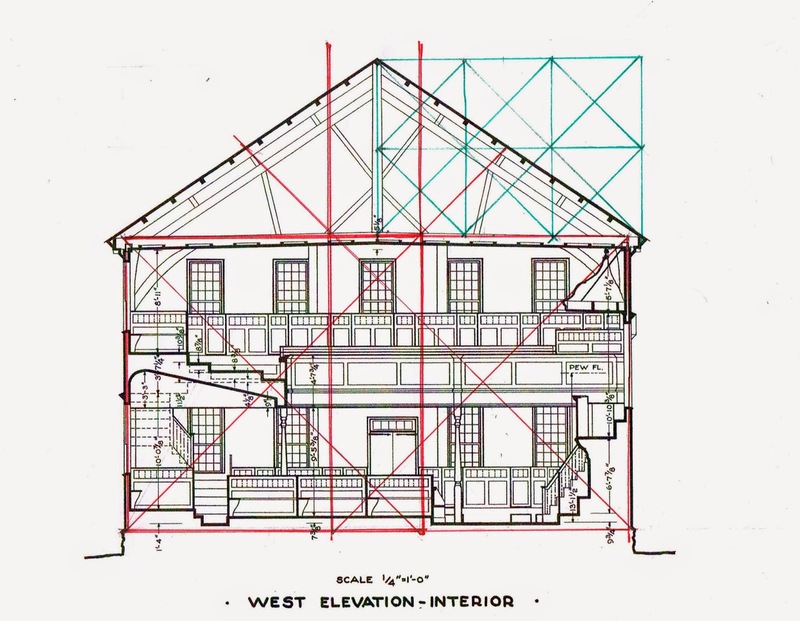 Luckily HABS drawings of the Meeting House are on-line. This photograph is part of that record. I borrowed it through wikimedia. A detailed history with photographs can be found at http://www.colonialmeetinghouses.com/mh_sandown.shtml. I thought I'd just see what Timothy Palmer built, and how he evolved as a master-builder - simple. Instead I found a larger fascinating history. But first: the geometry of the Sandown Meeting House. I know this is dense. Start with the drawings. Click on the images to enlarge them. Use my words to help explain what is there, why I added my lines. This would be so much easier to explain in person! I start with the simple geometry, the square. On the right side I have divided the square - see 'a-a-a-a' - in half vertically and then drawn the diagonals for those rectangles. The intersections are at the edges of the windows - see 'c'. The windows themselves are 2 squares. See the diagonals in the window upper left corner. Then I've rotated the square to show how the line determines the location and width of the entrance - see 'b-b-b-b'. This is quite basic design, balanced, stark - except for the door. The side elevations have similar window placements, though here the squares cross each other. See 'a-a-a-a' and 'b-b-b-b'. The placement of the windows is noted by the arrows at the bottom. The attic window follows the pattern - its placement and size determined by squares which grow out of the crossed squares below. I have not yet figured out why the door is off-set. Maybe the space needed for the stairs to the balcony threw things off. Note how the symmetry of the windows is so strong and the triangular pediment such an 'eye catcher' that one has to pay attention to see that the door really isn't centered! Where did Palmer begin his design? The church committee overseeing construction would have told him approximately how big to make the building. How did he determine his layout? I think he began with the pulpit. One square begins on the right of the pulpit and extends to the left; the other begins on the left and extends to the right. I have blacked in the columns as the design locates them. Here the lower edge of the squares runs through the columns which support the balcony. The center the squares locates the columns in the open space - both, however, in only one direction. The left and right sides of the squares are the locations of the posts on the north and south walls and the roof trusses above. See red lines on either side of the main aisle. Next I added the diagonals for the 'left over' rectangles created by the crossed squares - see the dotted red lines. Where the new diagonals cross the diagonals of the squares is the location for the second set of posts in the exterior walls and the post holding up the balcony. 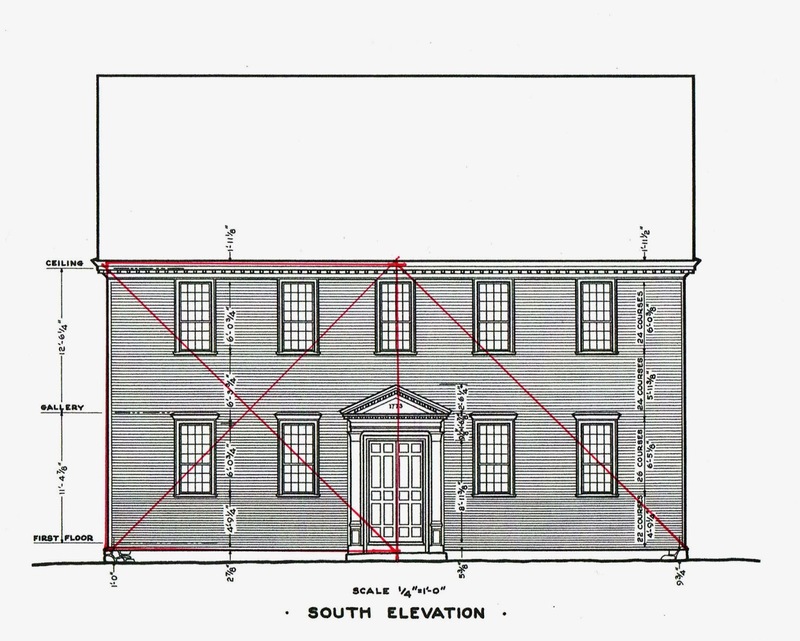 The length of the diagonal of the square is also the width of the meeting house itself. 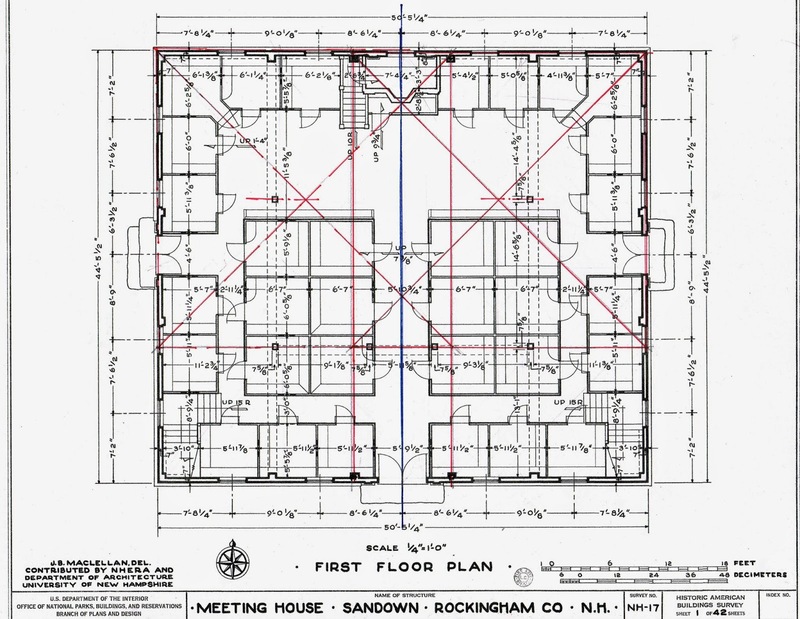 I have used that diagonal to draw a square inside the frame of the meeting house. It extends outside the building at the entrance and the pulpit. Where it crossed the outside walls is the line which determines the posts on each side of the central aisle. See the green square set as a diamond and its left and right green triangles. The final columns are those on either side of the east and west entrances. 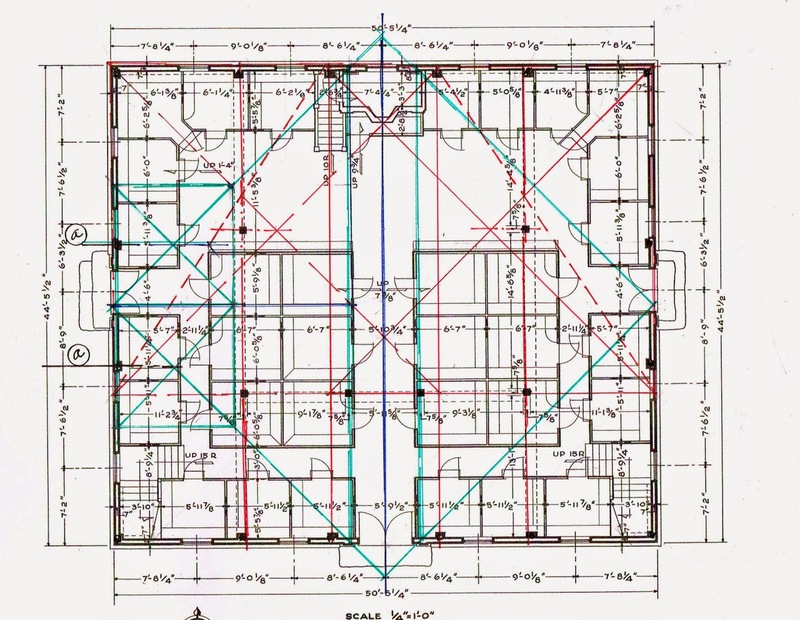 The triangles noted in green also mark off the 2 squares on either side of the central aisle. When those squares are subdivided, the subsequent intersections determine the columns - see the small squares and their diagonals on either side of the left (west) door. The West Elevation - Interior shows Palmer again using the crossed squares. The diagonals are also the position of mortises in the roof trusses. The extension of either interior diagonal lands on the top of the brace. The roof pitch is an 8/12. I have drawn it as an array of squares. I think the trusses may also be determined by the same geometry, but so far I've not worked it out. Many more parts of the building are determined by this geometry: the other braces, the balcony, the railings, the pulpit. If I draw them all the drawings becomes a mess - illegible. Instead I have posted a diagram for the entrance. The diagonals with solid lines, the perpendicular and horizontal divisions in dashed lines: 8 equal sections, 8 spokes. Timothy Palmer did not use circles with 6 points (the daisy wheel). 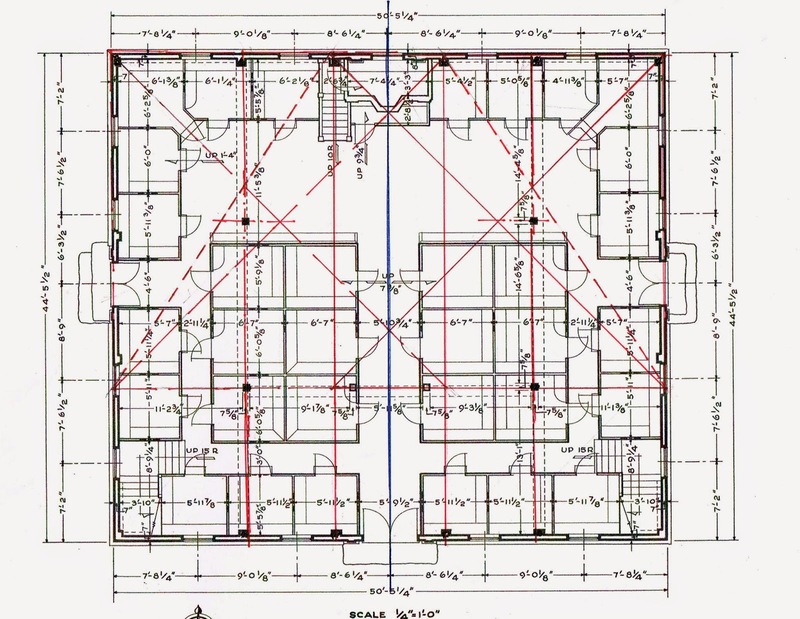 He did use the square 'flat' and 'rotated', and its 8 points to design the entrance. I just needed to determine his basic length: the radius of the circle. The first dimension I saw was the distance between the center of one pilaster and the other - the horizontal line in the middle of the circle. I deliberately white washed the extensions of that line to show the circle divided into 8 segments and the distance between the pilasters. 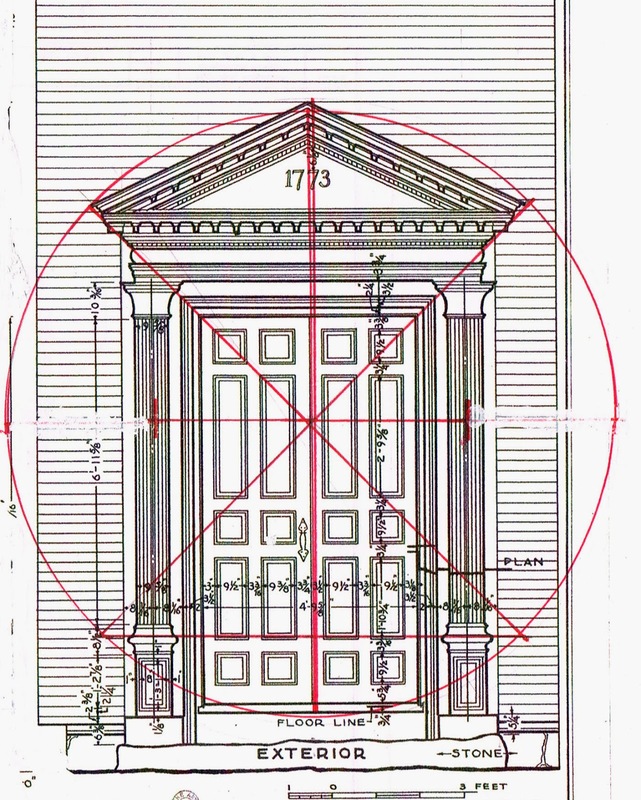 That length is also the radius of the circle that encloses the entry from the peak of the pediment to the bottom of the door. The width of the pediment is determined by the circle's upper spokes. The height of the pedestals is set by the lower spokes. The proportion of the door itself is the Golden Section. The use of geometry here in the entrances is much more sophisticated than that used in the facades of the meeting house. I thought the door and its surround might use the Golden Section. A circle fits much better. 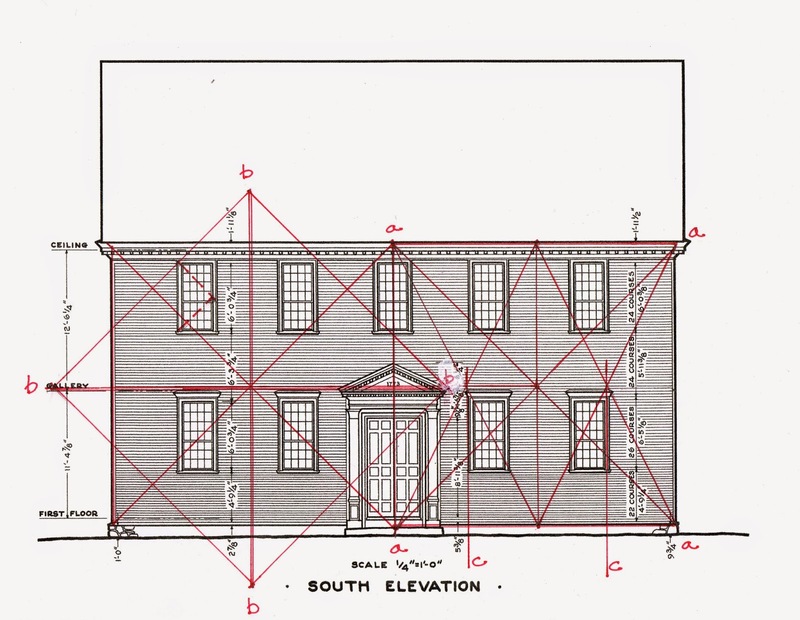 For a more complete discussion of the entrance geometry see my post on the Rockingham, VT, meeting house. Perhaps Timothy Palmer's own history accounts for this. He was apprenticed to Daniel Spofford, an architect and millwright in Newburyport, MA. Some records say he also learned shipbuilding from Ambrose Spofford. He seems to have been responsible, at age 23, for building this meeting house. Perhaps he also built the pulpit. His other responsibility was to span the open interior space of the church. He would have know what was necessary to frame a boat hull - which is in some ways an upside down roof. 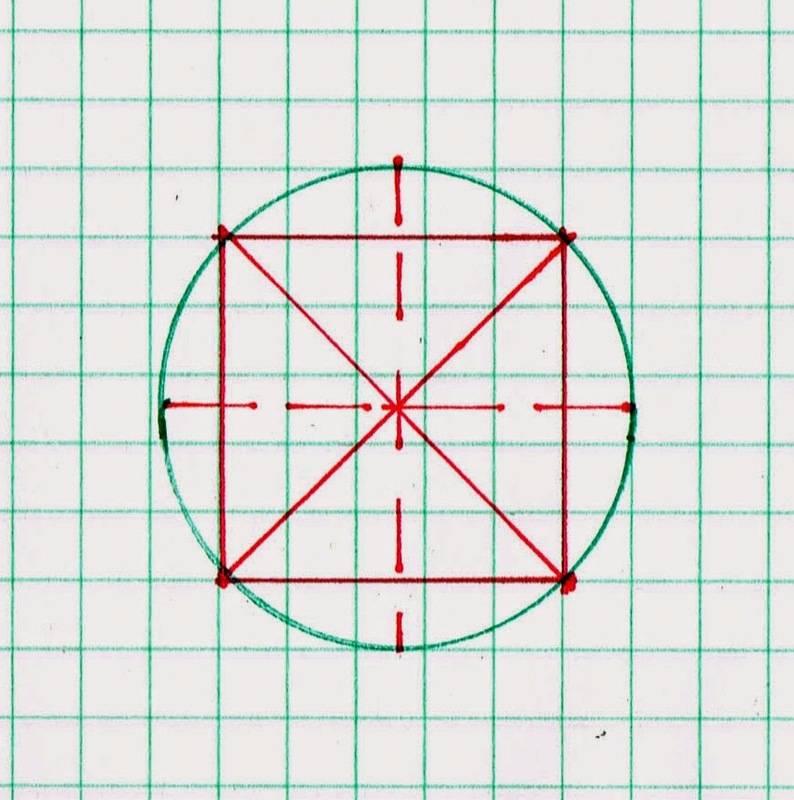 At the Rocky Hill Meetinghouse he used other geometry: a circle with 6 spokes or petals: a daisy wheel, a much more complex double square, and the 3-4-5 triangle. Coming up just a few towns west of Sandown, I knew their Meeting House to be considered one of the finest in the state, but had no sense of who had built it. Have you reached out to them yet? I would like to tag along !!! I would like to talk more about this, and would make the phone ring if I weren't on the road in the Northeast Kingdom and away from all contact information. Yes, I am coming to the Expo. I want to visit the Fremont and Danville meeting houses as well - not attributed to Timothy Palmer, but same time frame. 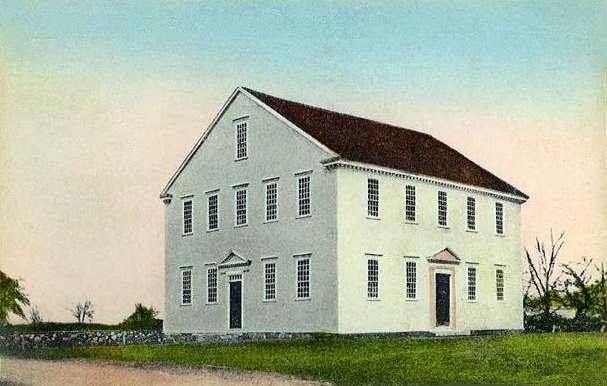 Perhaps the Rockingham,VT, meeting house too.